Drove from Flagstaff to San Bernardino, California today, across the most desolate terrain I'll see until...next Tuesday. The morning drive began in the forests of northern Arizona, about an hour south of the Grand Canyon. Wasn't really tempted to return to the Canyon: I've admired the view from the rim on several previous trips and taken a sightseeing flight over the gorge, so next time I'm either hiking down or rafting through. Instead, the day's first stop came at the well-stocked gift shop in Williams operated by Route 66 Magazine, a four-color glossy quarterly. Highly recommended for your one-stop Route 66 shopping needs. Then I took the advice of Route 66 Magazine, and everyone else who's ever written about the route, by stopping at Juan Delgadillo's Sno-Cap Drive In in nearby Seligman. I wasn't disappointed. The Sno-Cap experience begins in front of the building, where the menu offers "Dead Chicken" and good deals on "slightly used napkins and straws." A sign in the window reads, "Sorry, we're open." The entrance door has knobs on both sides -- I had to locate the hinges to know which one to turn. After talking to the proprietor (now in his mid-seventies) for a few minutes about Route 66, I made the mistake of asking him for "an ice cream." He returned with a dish of shaved ice topped with whipped cream. "Oh, you wanted an ice cream cone," he apologized, plopping an inverted cone atop the dish. For good measure he asked if I wanted mustard with my snack, squirting string from a mustard container at me. After receiving a normal cone, I walked away from this talking Harpo Marx with a big grin on my face. At Seligman, 66 loops well north of the Interstate for about 75 miles, along which there are two working businesses: the Grand Canyon Caverns and a new Route 66 shop/museum in the general store at Hackberry, where the new owner has parked a long-haired blonde mannequin atop a red convertible as further enticement for travelers to stop. 66 then intersects I-40 at Kingman before going off on its own again for fifty miles along a route no modern road crew could make comfortable for trucks and trailers. West of Kingman, 66 climbs Sitgreaves Pass up a series of narrow switchbacks which climb over 2,000 feet. It then tumbles down even steeper switchbacks on the way to the semi-ghost town of Oatman. The descent is so steep that 60 years ago, many cars headed east could only climb the hill in reverse gear: if they drove in the normal manner, their gravity-fed gas line couldn't get fuel to the engine! 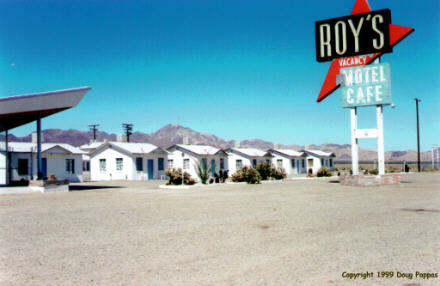 Oatman, a former mining town, had its moment in the sun when Clark Gable and Carole Lombard spent the first night of their honeymoon in the local hotel. Now Oatman is known for its burros. Descendants of animals which worked in the mines, they stand in the middle of the street, eating carrots out of tourists' hands. The supply of tourists must have been running low, for during my visit one of the burros walked up to the front door of a local restaurant and knocked on the door with a front hoof to demand a handout! Had to rejoin the Interstate to cross the Colorado River into California. West of Needles, though, 66 breaks away once again, following the tracks of the Santa Fe Railroad along the path of the National Old Trails Road. Marked in the mid-teens, the National Old Trails Road was the first auto path across the Mojave Desert -- the road taken by the earliest movie moguls who made Hollywood synonymous with the entertainment industry. Many abandoned buildings along the 200 miles of desert east of Barstow have themselves appeared in numerous films, TV shows and commercials seeking to evoke that "middle of nowhere" feeling.